Dutch Pro Soil Grow for soft water areas is a perfectly balanced feeding system full of macro and micro nutrients scientifically designed for soil medium. The mixture provides soil grown plants extreme amounts of the much needed nutrients for optimal growth and strength through all phases. Dutch Pro Soil Grow gives a totally balanced fertilizer rich in Nitrogen, Phosphorous and Potassium. The much needed cellular components of chlorophyll and proteins given to plants from Nitrogen provides the energy needed for optimal growth. Potassium provides the building blocks of proteins and starches for strength and protection required from diseases, pests and environmental hazards. Phosphorous gives the plants the ultimate growth of stronger roots, beautiful blooms and larger, more potent crops. 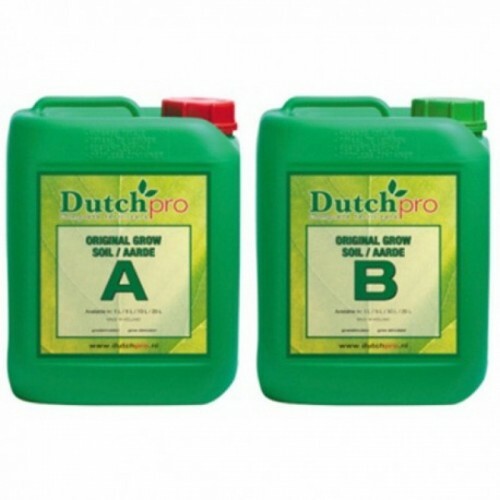 Dutch Pro Soil Grow Soft Water gives plants grown in soil medium a completely balanced feed system full of the much needed macro and micro nutrients. Dutch Pro Soil Grow Soft Water offers a total fertilization component to provide all the powerful strength building and protection constructing elements found in the NPK make-up inherent in the mixture.